US-based startup Carbon Relay has promised to cut energy consumption and lower carbon emissions at data centers, by using AI similar to the intelligence used in chess-playing computers. Founded in 2015, the company has just launched in public with around $6 million in funding, offering products designed to optimize energy use, and to predict future changes. It relies on AI designed to achieve complex goals, like winning a chess match, and delivers that to customers in the form of an assistant, providing "augmented intelligence" to human operators. Its first customer, and one of its backers, is Taiwanese electronics manufacturer FoxConn. A better game than Watson? Carbon Relay says its products are aimed at finance and operations executives responsible for large data centers, giving them the ability to cut energy costs, which can currently be around 70 to 80 percent of the cost of running a data center in the US. 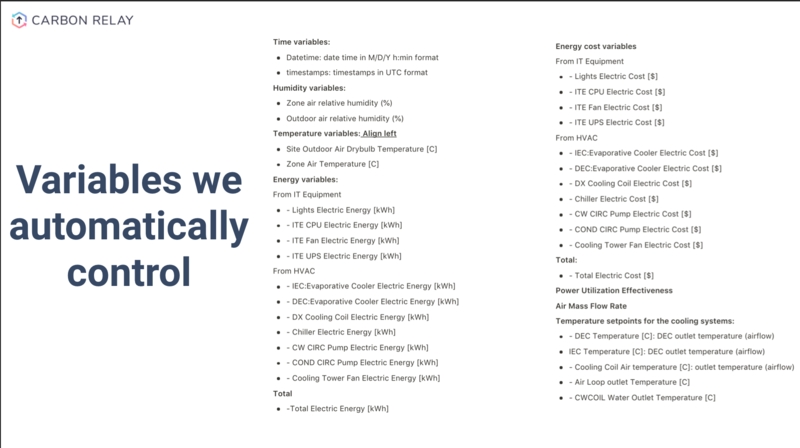 Carbon Relay has two products: Optimize and Predict, which collect information from customers’ existing IoT platforms, and use AI techniques on these massive data sets to continuously control and optimize the facilities' industrial HVAC systems. The company promises five times the cost savings delivered by competing approaches including the use of the IBM Watson AI platform. The Carbon Relay Optimize product promises to begin generating results within a week, based on using site-specific data to regulate the HVAC system. A spokesperson explained to DCD: "It only needs blueprints and an electrical layout to get up and running wth a simulation, and it can be delivering efficiencies in a week. Other products may need mountains of data and six months: this gets started quicker with a much lighter data load." The Predict product uses data visualization to predict energy demand and find more efficiency opportunities, so operators can "accurately visualize the energy road ahead" for their data centers, says Carbon Relay. The products use deep reinforcement learning (DRL), an AI technique designed to solve complex problems like winning a chess match. The insights are delivered through augmented intelligence, which will help people make better decisions, rather than replacing them. The products "seamlessly connect to customers’ existing IoT platforms, data visualization tools, and facility heating and cooling systems" says Carbon Relay, and will get energy cost savings that are "five times higher than those available with traditional products". In response to a question from DCD, the company said it would connect to traditional DCIM systems as well as the control systems of HVAC equipment. The company reckons that around 40 percent of energy use goes on HVAC systems (heating, ventilation and air conditioning), and optimizing these systems means tracking variables such as temperature and humidity, which can shift every few seconds, in multiple locations. 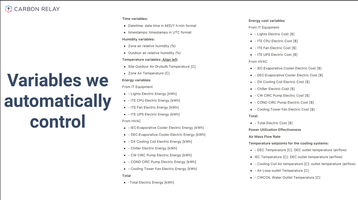 Current systems "cannot track, understand, predict or control enough of the variables associated with energy use by HVAC systems to yield efficiencies greater than three to five percent.," says Carbon Relay. The company clarified to DCD that it believes current systems including platforms such as IBM Watson, can only cut energy use by three to five percent. Carbon Relay's products should cut HVAC energy by 15 to 25 percent, according to this claim. “The Carbon Relay team has been together since 2015, driven to apply AI to one of the most pressing energy management challenges today,” said Matt Provo, co-founder and CEO of Carbon Relay. “We’ve taken on data center energy use because we have an opportunity, working alongside our customers and partners, to make a near immediate and massive impact on power use." The company has FoxConn as a financial backer and client, and has backing from Boston-based investors Dr. James Cash (previously on the board of Microsoft(, former Black Duck CEO Douglas Levin, and others. These bodies have given it $5 million in series A funding, alongside $1 million previously raised, from other sources.